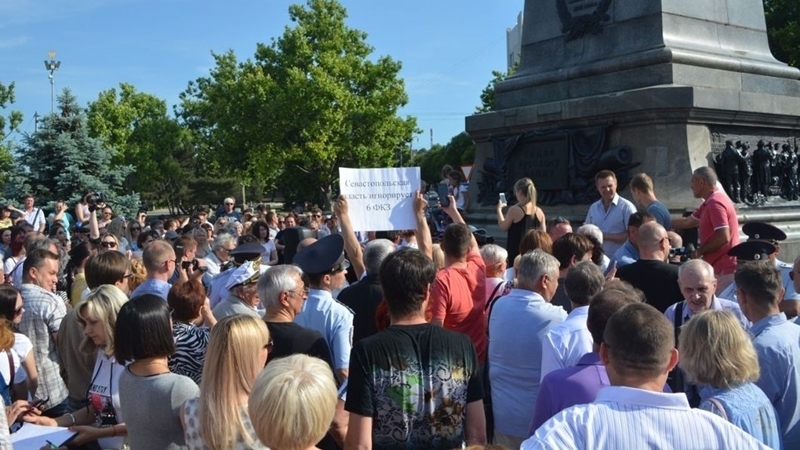 Residents of the occupied Sevastopol are holding a rally against the so-called government. During the rally participants stated that the "authorities" seized the land plots issued by Ukraine from the townspeople. The "government" of Sevastopol claims that about 3,800 land plots in the city were issued allegedly in violation of Ukrainian legislation. Representatives of small and large business gathered at Nakhimov Square in Sevastopol. The Director General of the plant of vintage wines "Inkerman" Sergey Lebedev noted that the company is on the verge of bankruptcy because of conflicts with the city "authorities", who refuse to extend the leasing contract on equipment and do not allow it to be redeemed. According to him, the company is weekly inspected. Participants of the rally added that since 2016 demolition of non-stationary trade objects has continued in the annexed Sevastopol. During the event, activists demanded the "government" to stop demolishing the non-stationary trade objects, seizing land from residents and pressing on big business. Earlier, in the occupied Sevastopol so-called bailiffs sealed the premises of the shipyard "South Sevastopol" and took away the property. Director of the plant Patimat Aliyeva stated that the "bailiffs" exceeded the official powers, knocked out the doors to the offices, took out the equipment, things, and documents without inventory.